Here’s some math. May domestic car sales came in at an annualized 4.50 million units (according to Stone McCarthy’s calculations), compared to April’s pace of 4.80 million and last May’s 4.98 million. Light truck sales declined in May to 8.09 million compared to 8.32 million in April. 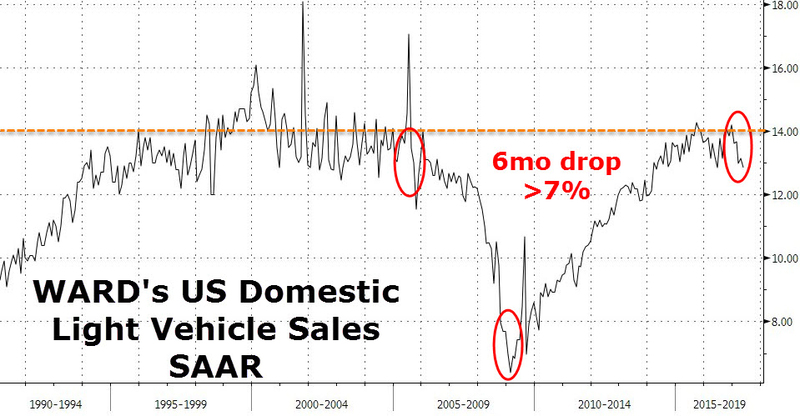 This is the worst six month drop in domestic light vehicle sales since the financial crisis. According to Bloomberg data, the industry-wide selling rate including imports slipped in May to about 16.8 million light vehicles compared with 17.2 million a year ago. This would mark the third straight month of a sales pace short of 17 million, which last happened in 2014. The ongoing slump adds up to the U.S. auto market’s first annual contraction since 2009. All of these numbers could have been far worse. In May, automakers spent a record amount on incentives to support sales and clear growing dealer inventory. According to J.D Power, incentive spending reached a record $3,583 per vehicle last month. 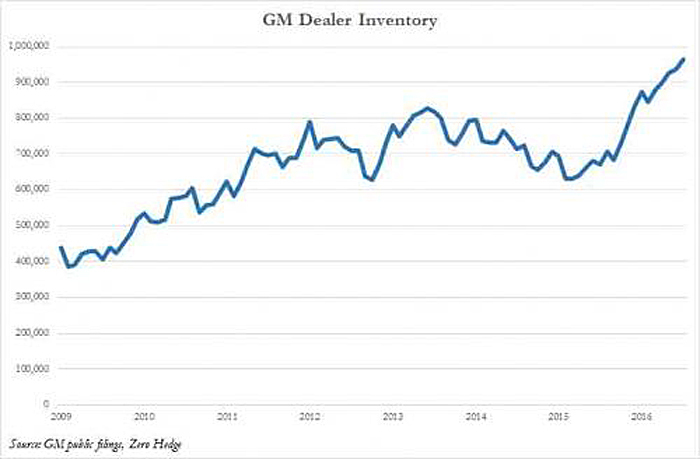 But despite all the discounts and incentives, inventories keep growing; the average number of days a vehicle spends on dealer lots has topped 70 for the first time since 2009, during the depths of the industry’s crisis. An annual pace of more than 16 million vehicles has historically represented strong, profitable performance. But no more. Automakers went nuts, supported by easy, cheap credit, and now they have to pay for it. Over production has saddled automakers with too much inventory, precipitating ever bigger discounts. “We will see more production cuts, particularly in passenger cars,” Autotrader’s Michelle Krebs says. GM reported end of May inventories of 101 days of supply. This looks to me like a world of hurt coming right up. Economic growth is going to suffer. Previous Previous post: Do Cars Drive the Market?